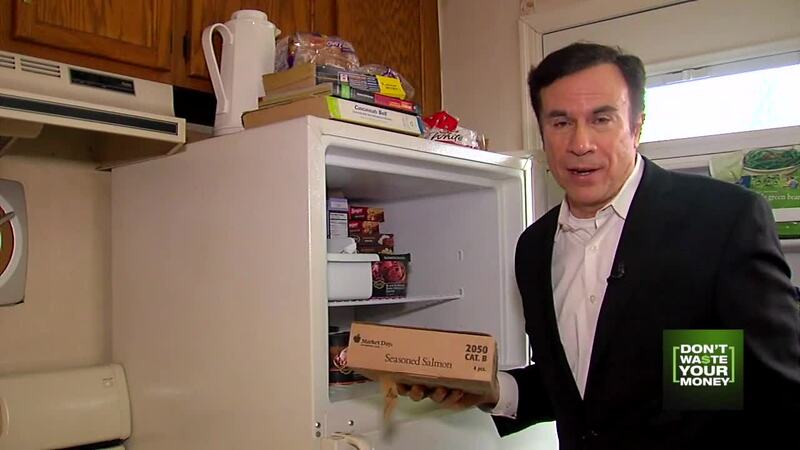 At the Wittekind house, the frozen food can be a lot older than two years. Les Wittekind found a bag of frozen Birds Eye chicken and vegetables with a December, 2015 "use by" date, making it well over three years old. The frozen salmon is dated 2014, making it five years old, and a tube of ground turkey is almost ready to graduate elementary school. "24 September of 2009," he said, "that's almost 10 years old." "If it said October of 2018, I probably would have eaten it," Wittekind said. "But 2017? That's out of hand." But Mary Ellen Wittekind says it was probably fine. "Three or four years old? We've never had a problem using it." This frugal retiree says it's easy to buy something at the grocery store, stick it in the freezer, and not realize for a couple of years it's been back there. She says she just makes sure the item is not exposed to air, where you then start to see physical degradation. "If a bag has a hole in it, then you have a problem," she said. Whole turkey or steak: 12 months. But in a deep freezer, the USDA says food can last decades, saying, "food stored at 0 degrees should last indefinitely. Only quality suffers with long term storage." Wittekind says she's never had a problem. "It seems to be OK," she said. One caution: The USDA says food frozen for the long term should be kept in a deep freezer at zero degrees, not in your kitchen freezer where the door opens 5 times a day, and the temperature may only be 25 degrees. So stay safe and don't waste your money.